Welcome to the new Designs by Debi Handmade Jewelry Blog! I'm glad you're here! Most of you may know that I've had a "Site Blog" since the website went live to update you when new pages are added to the site. Well, I've decided that I want a traditional blog, too. I want to get to know you, interact with you and be able to share things with you... sometimes about jewelry, sometimes not. And I hope you'll share with me, too. My name is Debi Auger and I live in Woonsocket, RI. 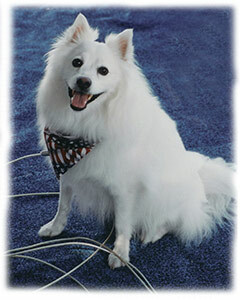 I'm an Eskie Mom... to a 12 year old American Eskimo named Niko. He's my child with 4 paws and the light of my life. Isn't he cute? I'm the designer behind Designs by Debi and the owner of it's parent company, Makana Mai Akua, Inc. (The name is Hawaiian and means 'gift from God.') I was blessed during a very difficult time to find the talent I had to design jewelry. I specialize in custom work and one-of-a-kind pieces and that's where most of my business comes from. I offer quite a few personalized bracelet designs for custom order. I now have 5 kinds of Keepsake Bracelets -- Name/Birthstone, Pet Name, Couples, Family and Generations. I also have Support Your Soldier Bracelets™, Rainbow Bridge Pet Memorial Bracelets™, Remember 9/11 Memorial Bracelets™ and Awareness Bracelets for all causes. The knack I have to create meaningful jewelry with sentimental value is a wonderful gift. It gives me a great deal of satisfaction to work on these designs and get to know the person enough to make them truly special. That's another reason I created this blog...to share thoughts, designs and ideas and gain inspiration by getting to know you.